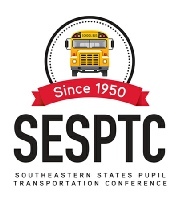 It is my privilege to announce the 69th annual Southeastern States Pupil Transportation Conference (SESPTC) to be held July 14 – 17, 2019 in Rogers, Arkansas, in conjunction with the Arkansas Association for Pupil Transportation. The SESPTC draws its Executive Board of Directors and delegates exclusively from the fourteen member states. It is the oldest and one of the most prestigious regional conferences on school transportation in the nation. Since its inception in 1951, SESPTC participants have consistently been at the forefront in promoting safe, secure, effective and efficient transportation to our school children. This year’s conference will include our Keynote Speaker, Lt. Col. Kevin Sweeney as well as workshops on a number of important topics including: reasonable suspicion, information from federal agencies, transporting students with disabilities, recruiting, security issues, and student management. Your state has long been a consistent supporter of SESPTC. Your continued support through the participation of staff from your agency’s school transportation administration office is essential to the success of this conference. School district delegates at this conference look to leadership from the state office and benefit greatly from interaction with state officials in the course of this event. We are planning on a State Leadership Forum, where State Directors are encouraged to attend, to discuss seat belts, federal regulations and other important topics. Thanks to the support of industry sponsors and exhibitors, the cost of attending this conference remains among the lowest for a regional conference and training with delegate pre-registration set at $175, which includes a delegate and one guest. Thank you for the important role you and your employees play in the safe transportation of school children. If you have any questions or require more information regarding the conference, please feel free to contact me or one of our board members. On behalf of the SESPTC Executive Board of Directors, we thank you in advance for supporting this important educational initiative.